The modular design and strong construction of the MX range offer stability and pressure for use in hygienic fields. 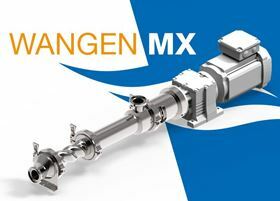 The MX range of hygienic progressing cavity pumps has now been added to the Pumpenfabrik Wangen GmbH product range. In recent years, Pumpenfabrik Wangen has optimised and expanded its hygienic pump range with the WANGEN HYLINE and the WANGEN Twin NG progressing cavity pumps and twin-screw pumps. The new MX range enhances that business area and meets stringent hygiene requirements around joints and seals. The modular design and strong construction offer stability and pressure for use in hygienic fields, as well as in the chemical, paint, lacquer and paper industries. It can also be used in other industrial applications where gentle and low-pulsation delivery is important. A key feature of the MX range is its EvenWall technology. The stator jacket is adapted to the inside contour of the elastomer and has a standard elastomer layer 4-12 mm thick, which gives higher stability under pressure. Pumpenfabrik Wangen GmbH is acquiring Knoll Maschinenbau GmbH’s hygienic progressing cavity pumps (MX range) division.